The cell. 4. The nucleus. Nuclear envelope. Atlas of plant and animal histology. In the late XIX century, a barrier limiting the nucleus was suggested, which was later confirmed by electron microscopy (Figure 1). The nuclear envelope is composed of two membranes developing a number of functions: a) it is a physical barrier that separates nucleoplasm (chromatin and the rest of the molecular content of the nucleus) from cytoplasm; b) it controls the communication between both, that is the movement of molecules btween the nucleoplasm and cytoplasm; c) it is in charge of the nuclear morphology; d) it contributes to the inner organization of the nucleus providing the anchoring points where chromatin is attached. Nuclear envelope is connected to the cytoskeleton, microtubules and actin filaments, to set the position of the nucleus in the cell. Figure 1. Electron microscopy image of the nuclear envelope. Figure 2. Organization of the nuclear envelope. It is composed of outer membrane, intermembrane space, inner membrane, and nuclear lamina. The outer membrane is continuous with the endoplasmic reticulum membrane. 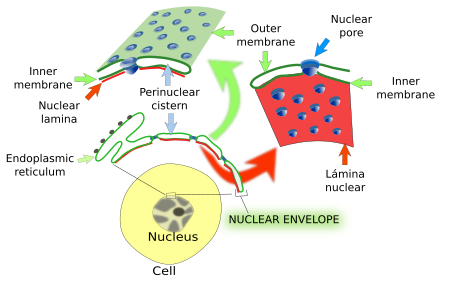 Nuclear pores are another component of the nuclear envelope. The nuclear envelope is composed of two membranes, outer and inner membranes, and an intermembrane space (25-40 nm in height) between them. All together they form the so called perinuclear cisternae (Figure 2). The outer membrane is continuous with the endoplasmic reticulum membrane. Attached ribosomes to the outer membrane are observed. This membrane continuity communicates the lumen of endoplasmic reticulum and the lumen of perinuclear cisternae. Thus, nuclear envelope may work as calcium storing compartment, along with endoplasmic reticulum. The inner membrane has a distinct molecular composition. 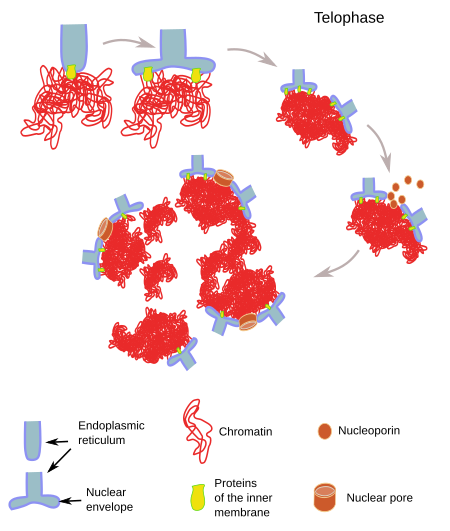 For example, there are transmembrane proteins linked to chromatin and to the nuclear lamina, another component of the nuclear envelope (see below). The inner and outer membranes are continuous at the nuclear pore complexes insertion places. How is it possible that outer and inner membranes have different molecular composition? A selective retaining molecular mechanism in the inner membrane has been suggested. Transmembrane proteins are synthesized in the outer membrane of the nuclear envelope or in the rough endoplasmic reticulum, and arrive to the inner membrane by lateral diffusion (thanks to the membrane continuity), but those that become linked to chromatin or to the nuclear lamina are retained in the inner membrane of the nuclear envelope. In animal cells, the nuclear lamina is a molecular scaffold located between the inner membrane and chromatin. In mammals, nuclear lamina is around 20 - 25 nm thick. The main components of nuclear lamina are proteins known as laminas, with two isoforms: type A (A and C laminas, which are the result of the alternative splicing of the same mRNA, i.e., the same gen) and type B (B1 and B2/B3 laminas). All of them are members of the intermediate filaments family. They are organized in a net lining the inner surface of the inner membrane of the nuclear envelope, linking the inner membrane and the chromatin. The attachment between the inner membrane and the nuclear lamina is mediated by at least 20 different types of proteins inserted in the inner membrane. Nuclear lamina performs multiple functions. It contributes to keep the organization of the nuclear envelope, and therefore the shape and size of the nucleus. The nuclear morphology changes when the expression of proteins of the nuclear lamina is altered, which can be observed during embryo development, cell differentiation and some cell pathologies. Nuclear lamina is also a place for anchoring the nucleus to cytoskeleton, allowing to place the nucleus in a precise location of the cell, and as well as moving the nucleus from one place to another. This connection is mediated by proteins inserted in the membranes of the nuclear envelope. The spatial distribution of nuclear pore complexes in the nuclear envelope is also influenced by the nuclear lamina. Another function of nuclear lamina is to provide physical support for chromatin, which affects gen expression. For example, chromatin anchored to nuclear lamina is not usually transcribed. These chromatin anchored regions are different depending on the cell type and differentiation state of the cell. It is suggested that nuclear lamina-chromatin interactions are regulatory elements of gene expression. During mitosis, nuclear envelope should be disassembled and assembled again. This process is mediated by enzymatic action (phosphorylation) over the laminas that causes breakdown of nuclear lamina, so that microtubules can contact with chromosomes. Pathological alterations of laminas result in the so called laminopathies causing nuclear disorganization, weaker nuclear envelope structure, and eventually cell death. Nuclear pores are inserted in the nuclear envelope. They are in charge of the trafficking between the cytoplasm and nucleoplasm (see next page). a) Gene stability. Confining the genome inside one compartment helps to maintain the stability of genes, which is higher than in prokaryotes; it should keep in mind that it is a huge amount of DNA. b) Gene regulation. Separation genome from cytoplasm allows gene regulation at a level that prokaryotes will never reach. For example, it prevents or allows the access of trasncription factors to DNA. Transcription factors are proteins that regulate gene expression and are synthesized in the cytoplasm. They must cross the nuclear envelope to work on the DNA. The molecular mechanisms that allow a transcription factor to enter the nucleus is usually the result of a chain of molecules, which may start with the activation of a receptor located in the plasma membrane. If some step of this chain is stopped, the gene will not be expressed. c) Eukaryotic genes contain exons and introns, meaning that a maturation process (cutting and splicing) of the primary mRNA is needed. It is dangerous to translate an unprocessed mRNA because it will produce malformed proteins, that may even cause pathologies. This mRNA processing is done in the nucleoplasm and only mature mRNA is allowed to cross the nuclear envelope. d) Transcription and translation taking place in separate compartments (nucleoplasm and cytosol, respectively) provide an additional tool for regulating the flux of information from DNA to proteins. In this way, the transcription of a gene into mRNA does not mean immediate translation. For example, preventing a particular mRNA to cross the nuclear envelope means that the cell will no have this protein at this moment. When needed, the synthesis of this protein will be very quick because the mRNA was already synthesized and to cross the nuclear envelope is the only thing that mRNA has to do to be translated in the ribosomes. In most eukaryotic cells, the nuclear envelope breaks in little vesicles during the mitotic prophase. It is known as open mitosis because cytosolic microtubules can gain access and make contact with chromosomes. Once chromosomes are segregated, nuclear envelope is assembled again during telophase from the membranes of the endoplasmic reticulum to form the nuclei of the two new cells (Figure 3). In yeasts, however, the integrity of nuclear envelope is maintained and new nuclei are formed by strangulation, as during cytokinesis. This is because yeasts are able to build a mitotic spindle inside the nucleus. This known as closed mitosis. Figure 3. Assembling of the nuclear envelope during telophase. 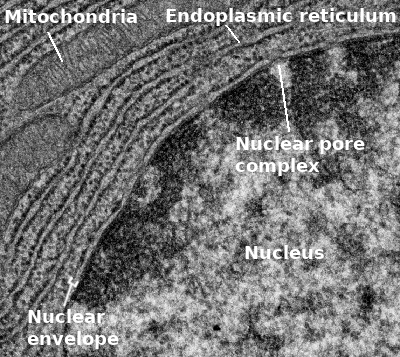 Membranes of the nuclear envelope are derived from the endoplasmic reticulum membranes. Chromatin and inner membrane of the nuclear envelope are linked through transmembrane proteins (modified from Wanke and Kutay, 2013). The nucleus can be found in different places of the cytoplasm depending on the cell type, cell activity and physiology. Sometimes the nucleus is passively displaced by other components of the cell like large lipid droplets of adipocytes and myofibrills in skeletal muscle cells, both cell types having the nucleus close to the plasma membrane. Generally, the nucleus is actively placed in a specific region of the cytoplasma by the interaction of the cytoskeleton with the nuclear envelope, largely by actin filaments and microtubules, but intermediate filaments can participate as well. In animals cells, the nuclear envelope may be connected with the centrosome, which drags the nucleus when moved through microtubules. Microtubules can also contact directly with the nuclear envelope. Movement is the result of the activity of the motor proteins associated to the cytoskeleton, although short distant movements may be consequence of the polymerization and depolymerization of cytoskeletal filaments. Proteins located in the nuclear envelope membranes are intermediaries between cytoskeleton and the nuclear lamina. Speed of 0.1 and 1 µm/min has been recorded. The faster movements, 10 µm/min, are those of the pronuclei of zygote after fertilization. There are several protein complexes linking the nuclear lamina to the cytoskeleton. They include transmembrane proteins in the outer membrane, KASH proteins (nesprins in mammals), and in the inner membrane, SUN proteins, of the nuclear envelope. There may be more proteins involved in making these cytoskeleton-nuclear envelope bridges (Figure 4). Figure 4. Interactions between the nuclear envelope and cytoskeleton that affect the movement, position, and size of the nucleus in the cytoplasm (modified from Starr and Fridolfsson, 2010, and Wilhelmsen et al., 2006). In mammals, there are 5 genes coding for KASH proteins, some of them showing mRNA alternative splicing that can generate quite long protein isoforms exceeding 800 kDa. KASH proteins have very long molecular processes that extend into the cytosol and contact the cytoskeleton. 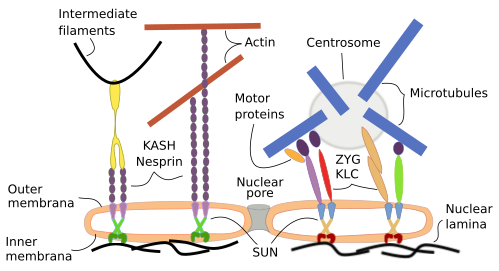 SUN proteins are linked to KASH proteins in the perinuclear space (between the two nuclear envelope membranes), and to laminas (components of the nuclear lamina) by their nucleoplasmic molecular domain.